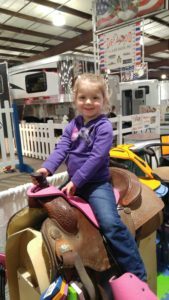 Saddle Sidekicks are designed to turn most adult saddles into a kids saddle and/or saddle for a smaller adult rider. 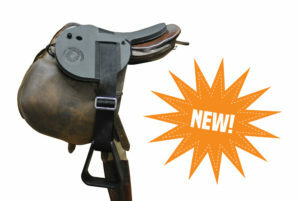 NEW – English Saddle Sidekick Now Available! Saddle Sidekicks now offers an English version! 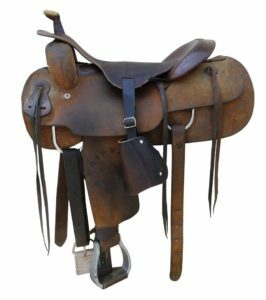 Click here to learn more about the English Saddle Sidekick. No more changing saddles! The Saddle Sidekick slips over virtually all full sized saddles in seconds! Contact Us with additional questions or visit our Saddle Sidekicks Online Store. The World Horse Expo was amazing!! Tom Seay and his team from “Best of America by Horseback” stopped in to see us. They are now fans! We are fans of them and “Best of America by Horseback” too! Thank you to everyone that stopped in and chatted with us! We love the feedback. Incredible news, Saddle Sidekicks was featured on “Best of America by Horseback” on the 2:00 pm broadcast, April 6, 2017, on RFD-TV. Are you looking for a small saddle for a child or smaller rider? Saddle Sidekicks fit over most full-sized Western saddles in seconds. They are stable and adjustable and stirrups are placed to ensure proper riding position. All too often smaller riders must sacrifice their form and comfort when using a full sized saddle. Saddle Sidekicks are a safe and economical alternative. They are easy to put on, adjust in seconds, provide increased balance. They come in cool, fun colors, and as they are adjustable grow with the child rider. They come in a regular stirrup or with tapaderos. Call us with feedback or with questions. We will send pictures and videos! Visit one of our dealers or visit our Online Store to purchase one today.